Based in southern New Jersey, William Lane has been writing professionally since 2001. His articles have appeared in the "Gospel Music Association's Artist Review," as well as online. Lane holds a Bachelor of Arts in adult fitness from Kean University and a Bachelor of Arts in Biblical studies from J.D.T. Bible College Training Center. If you are diligently sticking to your exercise program and notice a strange metallic taste in your mouth, don't panic. Although strange, this is generally not a serious problem and can have several causes. Exercise itself may not be the root cause; instead, the rigors of a workout may bring to light an existing physical condition. You may notice a metallic taste in the mouth while exercising due to poor oral hygiene. Gingivitis and tooth or gum infections all include tasting metal as a symptom. Though the bad taste may be present at other times, it is likely that the symptom is magnified when the body is under the added physical stresses of exercise. During exercise, body temperature increases and water levels decrease, which results in a dry mouth. 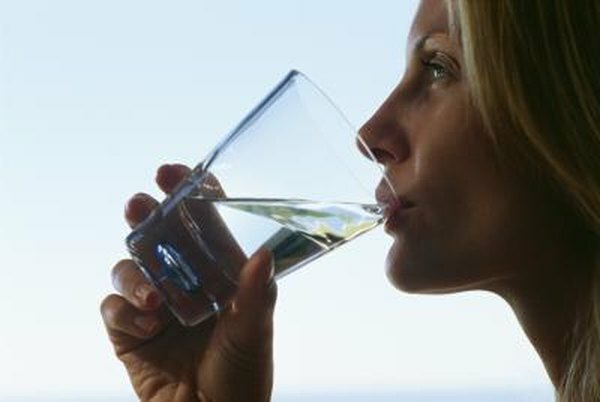 A dry, dehydrated mouth can magnify oral hygiene issues and leave you with a strong metallic taste in your mouth. Prescription medications and supplements may lead to a metal taste during exercise. Over-the-counter exercise supplements may be taken specifically for health and fitness purposes. However, herbal remedies and even some teas can contain the same ingredients as a supplement. Follow the recommended daily allowance for your body as prescribed by a doctor when you take any medications or supplements. Tasting metal during exercise can be a signal that you have taken toxic levels of the medications or supplements. In some rare cases, someone may taste metal during a workout because she is allergic to exercise. Just as food allergies cause specific reactions in the body, so can exercise induce an allergic reaction. Studies have found many people suffer from Exercise Induced Anaphylaxis, which can cause symptoms throughout the body. As with other allergies, the immune system mistakes a harmless function of the body for something dangerous. A metallic taste in the mouth is an early symptom of E.I.C. Progressed stages include hives, swollen mouth and throat, vomiting, drop in blood pressure and unconsciousness. Develop a lifestyle of hydrating yourself with plenty of water. Water serves to balance the body and helps prevent what you ingest from becoming toxic within your body. Those with unhealthy oral hygiene should make a dental appointment to have regular cleanings as well as repair to any infected areas of the mouth. Stay within the confines of recommended dosages for your prescriptions and over-the-counter products. Discuss any side effects of medications and supplements with your physician. In the rare case of E.I.A., immediately consult your physician for appropriate tests to pinpoint the direct causes of symptoms.